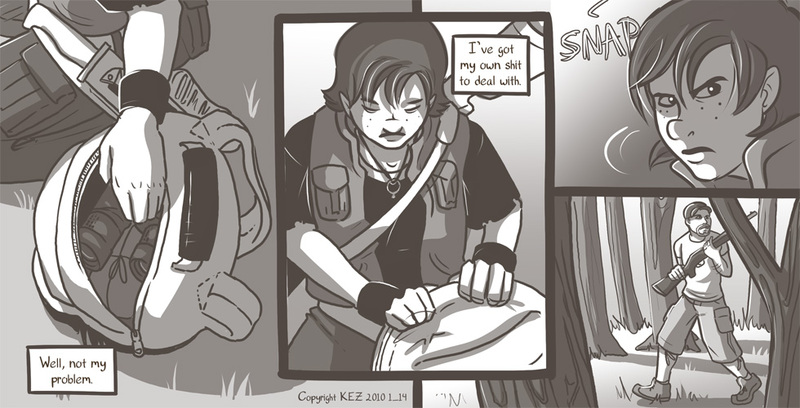 SpiderForest comic of the week is another new arrival to the network: Smyzer and Blyde! For awesome art, gritty action, characters with attitude and lotsa violence, go and visit! It's crime noir, high tech and an adrenaline rush. So, I went and saw Avatar last Monday. Holy chocolate cheerios, ALL movies should be made in this kind of 3D. The visuals were stunning. Absolutely gorgeous rendering and endless creativity on design. The movie itself, while horribly cliche and transparent, was still extremely entertaining, so I think I might see it again...if I can manage not to puke on the the Hollywood message being RAMMED DOWN MY THROAT. At least in Abyss it was something thought-provoking and still subtle. In Avatar it's being SCREAMED IN YOUR FACE THAT YOU ARE A VILE PERSON WHO ABUSES THE PLANET (AND WOULDN'T LIVE BE SO MUCH BETTER IF WE WORSHIPED THE INTERNET, I mean, GAIA, I mean, FIBEROPTIC TREES. Ahem. (Still, the whole electrochemical connection thing, THAT was a cool concept, I freely admit). Yeah, sorry. No one should feel horrible about themselves, their race, their job or their species when leaving a movie theater. Save that special responsibility for step-parents and in-laws. ZING. That's all from me! Come back Friday for another update!